BETTER than take-out!!! Flavors blend well and are delicious! 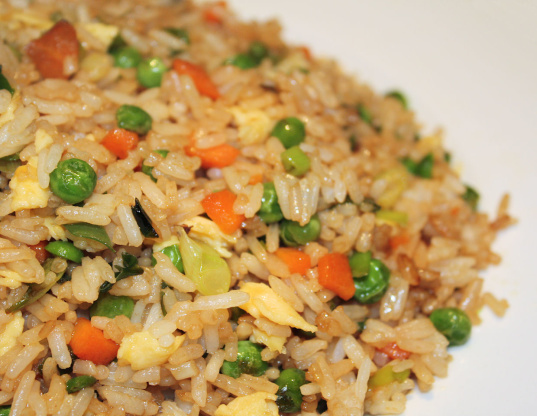 The keys to success for this recipe is using cold rice, otherwise it will be sticky. Also, for good flavor, sesame oil must be used. On low heat place 1 tablespoon of olive oil in large saucepan or wok. Cook beaten egg briefly, breaking into pieces. Add salt. Remove and set aside. Add 2 tablespoons olive to saucepan or wok. Add onions, carrot and peas. Stir-fry for 2 minutes. Dissolve chicken bouillon cube in the 2 tablespoons water. Place in pan and add cold rice, garlic powder, soy sauce and sesame oil. Toss lightly to mix well and heat for 3 minutes. Add in egg pieces and mix.